And coconut milk. It adds such a subtle sweetness to dishes, and of course that creamy coconut flavor. I used to make this dish often, but, of course, I forgot about it. Last night I decided it was time to bring it back. Unfortunately, I had written the recipe down incorrectly, and neglected to note how much vegetable broth to add. Last night I dumped in a whole can…which was too much. I’m going to take a guess that it needs maybe 1/2 cup of broth, and you can always add more afterward if needed. In other news, I just got the summer issue of Marie Claire Idees, and it’s full of fun ideas (never mind that I can’t read a word of it. That’s not true, I know that ete is summer.) It’s been out in France forever, but it just came out in Austin…I check every week or so at our bookstore. I should really just subscribe to the magazine through Amazon…maybe then it will come earlier in the season. Tonight we’re off to Whole Foods to have dessert with Chad and Lindsay, and then I will plant myself in front of the television for Project Runway. On to the food! Heat olive oil in a large skillet over medium-high heat. Saute the tofu until golden on all sides, 8 to 10 minutes. Remove tofu from pan. Add sesame oil to pan; saute garlic and ginger 1 minute. Add peas and bell pepper; saute 4 to 5 minutes until softened. Add broth to pan, scraping pan to loosen browned bits. Add coconut milk, soy sauce, rind, and juice; bring to a boil. Reduce heat and simmer 5 minutes or until slightly thick. 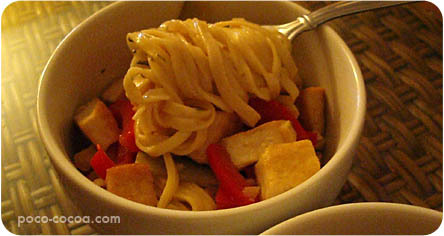 Add pasta and tofu; toss to coat. Top each serving with green onions, if desired. YUM. I love the coconut too. Sadly my husband doesn’t so I don’t make it much. But that looks divine!